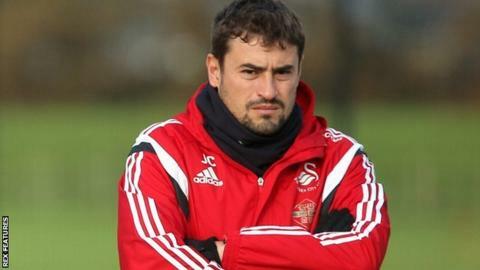 Swansea City's assistant manager Pep Clotet and coaches James Beattie and Kris O'Leary have all left the club, following the departure of Garry Monk. Clotet, 38, joined the Swans academy in 2013 and became Monk's assistant when Michael Laudrup was sacked in 2014. The Spaniard was among the candidates to become Brentford's new boss before the London club appointed Dean Smith. Ex-England striker Beattie was named first-team coach in June, while O'Leary had been with the club since July 2012. A Swansea statement said an announcement about the management structure for Saturday's match at Manchester City "will be confirmed in due course". The club parted company with Monk on Wednesday following a run of just one win in 11 Premier League games, which left them one point above the relegation zone. Former Swans boss Brendan Rodgers and ex-Manchester United manager David Moyes are among those to have been touted as potential successors to the former Swans captain. Monk led the club to eighth place last season and a club record Premier League points total, and ex-Swans boss Roberto Martinez praised that record on Thursday. "What he has achieved there is nothing short of remarkable," Everton boss Martinez said. "What he achieved last season will be in history for a long time. "I am sure he is going to have a refreshing break period and will be ready to come back. "Ideally you want to see long-term projects and managers being able to put things into place, but it's not a subject of debate. "It's what happens now in the game and you have to accept it. "He was my captain at Swansea. We have a really good professional relationship and I respect him a lot. "He should feel very proud of what he has achieved."